This week in celebration of February Fall in Love Month, we are going to go over some power principles on how to fall in love with your life. 1) The Energy Gainer/Drainer Quotient- Pick up one, drop the other. When you’re overwhelmed and fried, it’s easy to feel like you need a total do over in the game of life. Often what you really need is to up your major Energy Gainers and get rid of a few Energy Drainers and in no time flat you’ll see your zest for life return, and your equilibrium come into its own. Energy Gainers are those activities, people and circumstances that boost your energy, enhance your enthusiasm, and allow you to feel back into flow. When polling my groups and individual clients on what their Energy Gainers are, some of the most common responses have been: more sleep, baking cupcakes, long walks, petting my dog, dancing, going for a jog, the list goes on. Again, don’t make it into a project. Start simple and just do it. For me, I love taking a bath and then crawling into bed. While it is incredibly relaxing, I find the next morning I am full of energy and ready to take on the world (or at the very least, my “Things to Do” list). Look at your list, and pick one opportunity during the week to add an Energy Gainer. Energy Drainers are those people places and things that really drain your energy. The most common ones I hear are: toxic people, clutter, technology overload, and over-committing (even if it’s things that you enjoy). The list goes on. Again, find a way during the week to eliminate one energy drainer, and you’ll be amazed how different you feel. A client of mine has a family member who is exceedingly negative, so the energy drainer she eliminated for that week was that when she calls this person she stayed on for a mere five minutes to get the information she needed versus the fated obligatory “How are you?” question, that would usually result in a complain-a-logue for the next 20 minutes. If you do this regularly and consistently you’ll be amazed how much more sense your life makes and how much more energy you have in your life. By the way, if when you look at your Energy Gainers list you still feel uninspired and tired, just focus on eliminating the drainers, it’s amazing how your energy can get restored by doing that. 2) Say “Yes” when you mean it and “No” when you don’t. This can be a tough one, especially for women. The RGGS (Recovering Good Girl Syndrome) is alive and kicking in most women, and a tough habit to break. There’s a whole mess of science behind it but suffice to say we’re hardwired and socialized to fluctuate between people pleasing and then boomerang to Resentment Central. Neither destination is very appealing. Many women have totally overridden our DNA to people please, then there’s the remaining 92% of us that are still in the process. Conversely, delight in “Yes” when it’s a fit and inspires you to move forward. For those of us wildly curious people (like myself) sometimes a brief pause or taking one day to respond to a possible “Yes” gives us the time to sit with it, and if it’s right, celebrate something new we’re taking on in our life. 3) Take one action per week that’s in line with creating a life that you love! You can do more (if you want) but don’t put needless pressure on yourself and like I have said, “Don’t make it a project!” So if traveling to Southeast Asia is on your bucket list but your budget and schedule may not permit it for awhile, take out a travel book on it, or do a collage with images of that part of the world to inspire you to get there. For me, I always wanted an old farmhouse in the country for a weekend home, so I would collect things (welcome signs, cool soap dishes) and put it in my “Woodstock House” bag years before I had the house. Ironically when I did buy a house, it was 6 miles from where Woodstock really happened (Bethel). Funny how when we plant the seeds for creating a life we love, it happens. February is Fall in Love Month! Welcome to Part 1: Let the Courtship Begin…With You! This is the hardest thing for most of us. I get a chance to work with such amazing people both in my coaching and speaking work, and I’m always amazed at how hard people are on themselves. It’s something I relate to myself. What I notice is how that totally kills off the opportunity to experience our most vibrant selves and live our lives as fully as we would like. Here are some favorite principles of mine that I find invaluable both in my own personal work, as well as my work with my clients. W.C. Fields once wrote, “I never act with kids or animals.” No wonder why, they’re curious about everything and therefore you can’t keep your eyes off of them. You find their curiosity for life utterly compelling. Well guess what? Somewhere down the road, your curiosity got “socialized” into criticism, perhaps trading it in for cynicism, self-condemnation, rational thinking, the list goes on forever (yawn!) and you fall out of love with yourself. No worries, you can get back on track. Get curious! Just like you’d offer your rapt attention to hearing about a fabulous cruise to Alaska, or the latest gossip in Hollywood, direct that interest to yourself. When we get curious about ourselves, our thoughts, behaviors and actions, we can move forward and grow. Need I go on? If I didn’t get curious, I would have stayed in Excuseville or went down the “whirling dervish of crapdom,” (my client identified that her as her negative spiraling self-talk). Instead I got curious about the Grumbles, even had a little chuckle, visualizing them as little creatures burrowing themselves in my unconscious, not unlike those brilliant animated characters on the Mucinex commercial. I realized that I’m just hitting some resistance as I am working on creating a more active dialogue with my online community. Fifteen minutes of writing later, I am reminded of my love affair with learning and sharing and contributing. This week’s life work: Take a criticism break this week and whatever comes down the pike, embrace it with a spirit of curiosity with yourself and others (even if that means getting curious about your Itty Bitty Committee, those scrappy self-sabotaging thoughts going on in your mind). Be genuinely interested whether you have a solution or not. Check in with your body, spirit and see how different you feel. 2) I’m not perfect…but some of my parts are excellent! I saw this on a T-Shirt many moons ago, and it has stayed with me. It’s just too easy to focus on our personal challenges, handicaps and poor habits. This just brings more of the same; self-doubt, condemnation and remaining stuck. Now there’s nothing wrong with working on one’s self and totally striving towards growth and development but that’s not what I’m talking about here. I’m talking about chronic self-condemnation, or judgment. How do you remedy that? By focusing on what aspects of yourself are quite wonderful and you appreciate. While I’m a huge fan of a gratitude list and I do write one almost every day, I say, step it up to a Self-Appreciation Log. Close your eyes and check in with your energy. Flat, Fired up, or Fried? Then open your eyes, and write a list of 10 things to appreciate yourself for. It could be that you are a good friend, went the extra mile that day for a co-worker, or you finished a project that you’ve been dragging your heels with for 3 months. It doesn’t matter. Write the list, then close your eyes and breathe, and notice how different you feel. You may feel confronted, self-appreciated, or delighted but it will definitely shake things up in a great way. 4) Mindfulness is a must! My favorite motto, “The faster your outer world is, the slower your inner world needs to become” really addresses this. Having some mindfulness practices allows us greater presence and passion in our life, so we can appreciate ourselves. I find that finding an opportunity to do some form of selfless service with no agenda of reciprocity is extraordinary for not only helping people around us but also shifts how we experience ourselves. If you’re tapped out in the volunteer/advocacy/caretaking realm, don’t sweat it. Do something really simple. Open a door for someone. Help an old person across the street. I have a client who buys several pairs of really reasonable gloves and then hands them out to homeless people. 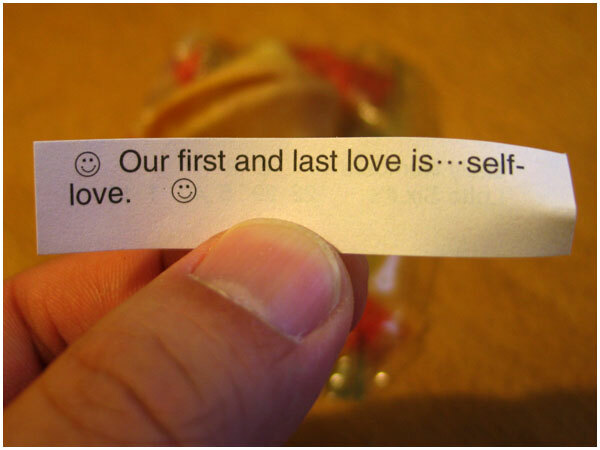 This week let yourself fall in love with yourself, most likely many people in your life already love you! I would love to hear your thoughts, and comments!